The MIX multiagent architecture has been conceived as a general purpose distributed framework for the cooperation of multiple heterogeneous agents. This architecture, starting from previous work in our group on multiagent systems, has been redesigned and implemented within a research project investigating a particular class of hybrid systems: those integrated by connectionist and symbolic components. 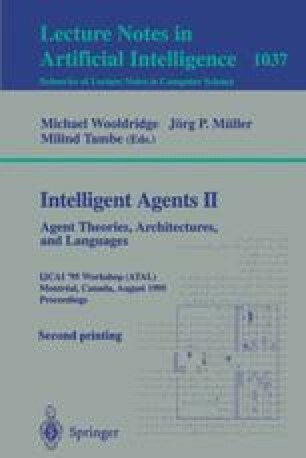 This paper describes in some detail the principal concepts of the architecture: the network model and the agent model. Around these models, a set of languages and tools have been developed. In particular, an Agent Description Language (MIX-ADL) has been designed to specify agents declaratively in a hierarchy of classes. This research is funded in part by the Commission of the European Communities under the ESPRIT Basic Research Project MIX: Modular Integration of Connectionist and Symbolic Processing in Knowledge Based Systems, ESPRIT-9119. The MIX consortium is formed by the following institutions and companies: Institute National de Recherche en Informatique et en Automatique (INRIA-Lorraine/CRIN-CNRS, France), Centre Universitaire d'Informatique (Université de Genève, Switzerland), Institute d'Informatique et de Mathématiques Appliquées de Grenoble (France), Kratzer Automatisierung (Germany), Fakultät für Informatik (Technische Universität München, Germany) and Dep. Ingeniería de Sistemas Telemáticos (Universidad Politécnica de Madrid, Spain).